Editor’s Note: Nelson Tull is a graduate student in the Department of Civil, Construction, and Environmental Engineering at North Carolina State University. With adviser Casey Dietrich, he is conducting research to improve hurricane and storm surge guidance to emergency managers of the coastal counties in the state. They are collaborating with Rick Luettich at the University of North Carolina at Chapel Hill Institute of Marine Sciences, Brian Blanton at the Renaissance Computing Institute (known as RENCI), and Jason Fleming with Seahorse Coastal Consulting. This research is funded by the National Consortium for Data Science, based on a previous project supported by North Carolina Sea Grant. Storm surge model forecasts are a critical tool coastal emergency managers use to plan and make decisions. These models must be both accurate and fast, to give reliable information in a timely manner as a storm moves toward the coast. Then the forecast guidance must be visualized in a way that is meaningful to end users. We use ADCIRC, a powerful computer model that can predict coastal flooding due to storm surge on regional and even continental scales. During a tropical cyclone event, ADCIRC is run every six hours when the National Hurricane Center issues a storm advisory. 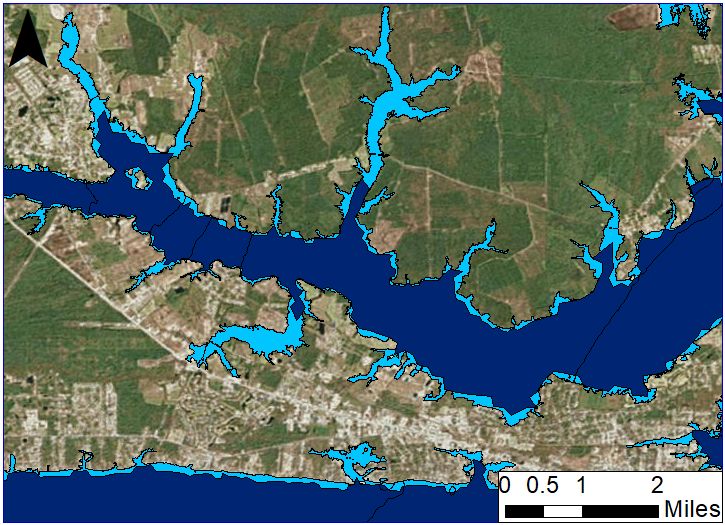 The image shows the model-predicted storm surge in coastal North Carolina for Hurricane Matthew Advisory 27, which was issued on Oct. 4, 2016, four days before the center of the storm moved past Wilmington, NC. This advisory called for a stronger storm and thus greater surge than actually occurred. Model forecasts are currently visualized using Kalpana, a computer program developed with support from North Carolina Sea Grant that converts the model results into visual formats that are easily understood and useable by local stakeholders. The image below is an example of one such format (ArcGIS). (Figure 1) Map of maximum water levels for Hurricane Matthew Advisory 27 in North Carolina. The black box represents the zoomed region shown in the following image. North Carolina Emergency Management (NCEM) needs forecasts of the maximum flooding that is expected to occur along the coast during a storm event to make evacuation decisions and develop damage estimates. Although our model provides water level predictions from the deep ocean all the way to the coastal floodplains, the extent of the predicted overland flooding may be limited by the model resolution. The model may not include topographic features, such as roadways or narrow stream channels, at scales smaller than about 200 to 500 feet due to concern over computational time. As a result, there may be locations where the model flooding extent is an underprediction. The elevation dataset used by the NCEM has higher resolution and is well-suited for the task of determining the true flooding boundary. Continuing from a North Carolina Sea Grant project and with new support from the National Consortium of Data Science, we are developing a method to improve prediction of the true flooding extent by combining the results of the model with the more accurate elevation datasets. To perform this prediction of the flooding extent, the new project uses a Geographic Information System (GIS) called GRASS GIS that specializes in processing very large amounts of data. 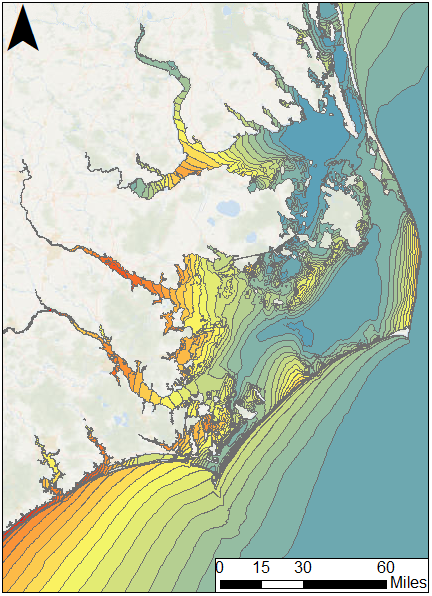 Because the goal of the project was to improve the flooding extents across the entire coast of North Carolina, the elevation dataset was very large, and therefore GRASS GIS was the ideal tool to use. The project has two major objectives. The first was processing the modeled water levels and the elevation dataset together, producing a map showing the extent of predicted flooding. When the modeled water levels are greater than the elevation of the land, these water levels at the boundary of the flooded region in the model are extended outward into neighboring, unflooded areas in the dataset. This results in more accurate surge forecasts through the enhanced resolution of overland flooding. By enhanced, we mean that the model results have been mapped to the higher-resolution datasets and extended further into the estuaries and floodplains. The result is illustrated in the image below. (Figure 2) Zoomed image of flooding along the Newport River, just northwest of Morehead City in Carteret County. The dark blue represents model-computed flooding for Matthew Advisory 27, while the light blue represents the flooding boundary produced by the enhanced resolution. The second major objective was speed. Because the model is used for real-time forecasting during storm events, it is critical for the process to be fast. From a practical standpoint, NCEM needs to know how high the water will be and where flooding will occur, and they need to know this information as fast as possible. Therefore, for the process to be fast, the enhanced-resolution program has to use methods that can work efficiently with large amounts of data. After exploring several methods and trying different ways of structuring the program, we developed a process that requires 15 to 20 minutes to run, depending on the complexity of the storm. This new technology is slower than the existing visualization methods, because the lower resolution means they can be run quickly (e.g., dark blue region in Figure 2). But the new visualizations are more accurate (e.g., light blue regions in Figure 2) than what is currently available, and they can still be provided to NCEM in a timely manner to help them make better decisions. This process will become part of the current workflow at Seahorse Coastal Consulting and RENCI that includes running the ADCIRC storm surge model for every forecast advisory during an approaching storm. Our goal is to turn around the model forecast in 60 to 90 minutes, immediately followed by the 15- to 20-minute, enhanced-resolution program. This new and improved guidance is being shared with NCEM during the 2017 hurricane season. While this project has given state emergency managers in North Carolina new capabilities, we would need additional work to apply this method to different coastal regions, such as Louisiana or Texas. In addition, we continue working to improve the speed of the program, because for those who live on the coast and those in charge of protecting them, every minute of preparation counts when a storm is approaching.